Blue-spotted salamander is an amphibian specie of Canada that if found in Ontario, southeastern and Quebec province from Great lake region to the south and James Bay to the north of its territory. Blue spotted salamder are mole salamander the can grow to a length of 8 to 15cm for which the tail can count for up to 40%. Blue-Spotted salamander skin is blue to black with a paler belly, blue flecks on their back and blue to white spots om their flanks and tail. Blue spotted salamander are elongated but not has much has their cousins, the Jefferson salamanders from which they cannot be distinguished reliably without genetic tests. This mole salamander specie have long toes: 4 on their front feets and 5 on the back feets. Males blue-spotted salamanders are usually smaller than females and they have a more flat and long tail. 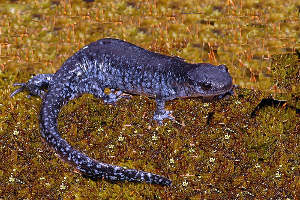 Blue-spotted salamanders are found in moist hardwood forests and swampy woodlands but they can also be found in coniferous forests and fields too. They also like to use rocks, logs, underbrush and leaf liter for shelter. Blue-spotted salamanders have nocturnal behavior and are especially active on warm rainy nights. Males and females of blue-spotted salamander first mate in vernal pools around two years old in early spring. Female lay up to 300 eggs annualy in small clutches of around 12 eggs attached to rocks or plants at the edge of a pond. Eggs hatch for about one month before blue spotted salamander larvaes emerge with their well developed mouth and eyes. Front limbs form at two weeks, and hind limbs form at three weeks. It will fully transform into a full terrestrial state by late summer. Outside of the breeding season, adults blue-spotted salamander are terrestrial carnivores, eating a large variety of insectsm spiders, worms and other invertebrates..